Does Your Roof Look Old and Worn-Out…? Gold Roofing specialises in roof restorations and re-roofing homes all across Brisbane, Ipswich, and the Gold Coast. You don’t need to go anywhere else, because Gold Roofing is the home of the super guarantee which says…..
You see, we understand that when you get a job done, someone has to take a risk. Why should that have to be you? We take the risk away from you and put it back on us. With such a bold guarantee, we have to perform! Every time. For a FREE quote with no obligation for your roof restoration in Brisbane, call us today on (07) 3276 0464 or fill out the contact page and we’ll be in touch by no later than next business day (usually sooner). Experience a leaky roof in the middle of a dreary, rainy night in Brisbane to get a taste of a down moment in life. If your faulty roof is the result of extreme procrastination, call Gold Roofing today for a free estimate. Our warranty is more than mere words written on a piece of paper. Your warranty is good for ten years. At Gold Roofing, our word is worth its weight in gold. Imagine the relief you feel in knowing that we warranty our Brisbane roof for an entire decade. Additionally, you are sure to appreciate the excellent workmanship and materials we use for our roof restoration Brisbane customers. 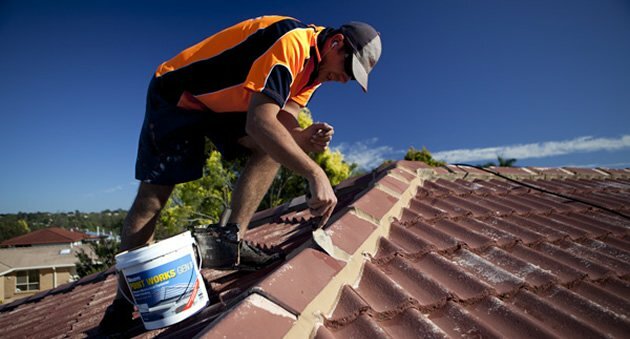 Contact our Brisbane roof restoration company if your roof needs repairs. Our roofing contractors may have the option to restore the entire roof instead of charging you for expensive repairs. Brisbane roof restorations require several important steps. The first step involves pressure cleaning your roof utilizing a special detergent. Using detergent prior to pressure cleaning your Brisbane roof protects weak shingles from becoming loose. Hiring contractors specializing in roof restorations ensures that your roof is not damaged by the pressure cleaning process. It is a good idea to pressure clean your roof every couple of years. A careful inspection of your roof yields interesting information to our Gold Roofing professionals. Our roofing inspector provides you with a complimentary assessment. A cracked tile or a broken tile needs prompt attention. Otherwise, you may wake up from a peaceful sleep one night only to experience raindrops falling on your blanket, bed and body. Plus, our contractor knows how to match each tile. You do not want to install the wrong tiles. Otherwise, your efforts to restore the roof may fail. Our roofer makes sure that each new tile fits your roof in a snug and secure manner. In addition to washing your Brisbane roof, pressure cleaning the roof and repairing cracked tiles, our Gold Roofing contractor may need to repoint your roof’s ridges. Repointing is the term used for Brisbane roof restorations requiring repair work on damaged mortar. Repairing damaged mortar via a repointing process prevents moisture from damaging your roof. Now is the time to hire a Brisbane roofing contractor if you have never hired a professional to repoint the ridges. Your roof’s ridge tiles protect the home from water damage via the roof. Each tile requires a special pointing mixture. Do not attempt to repoint the tiles yourself. Repointing is demanding, precise work best performed by our Brisbane roofer. After repointing the tiles, the next step is to coat your roof with a primer. Our professional roofer cleans off all debris and oil from the roof prior to applying a sealer. It is also important to use the right type of primer to match your location’s weather conditions. Our roofing restoration contractor knows which types of roofs require sealers. For instance, metal roofs typically need primers. Remember that sealers often contain potentially harmful chemicals. Hire a professional roofing contractor to ensure complete safety. Proper roofing restorations in Brisbane also demand two, or even three, coats of a special acrylic coating material. Hiring an experienced roofer ensures that the job is done with exactness and complete attention. Coating provides your roof with additional protection to ensure longevity of the roof’s restoration work. Prevent further damage when our roofing contractor applies ample coats to protect the roof. Contact Gold Roofing if you want to reroof your Brisbane roof for a reasonable cost. Whether you have resided in your home for years or recently purchased an older house, you deserve to hire the best professional roof restoration Brisbane contractors in the roofing business. Our accomplished roofers have received ample training. You can request a list of clients who have previously contracted with our company. We pride ourselves in offering you the best customer service available anywhere in Brisbane. In addition, all of our roofers are bonded and insured. You are eligible to receive a complimentary quote by placing a simple phone call to (07) 3276 0464. Additionally, you will receive a free safety inspection from our experienced roofing contractor. It is time to face the fact that your roof currently needs the help of an expert. Roofing restorations prevent roofs from leaking. Plus, a roof restoration gives your house an entirely new appearance. Your home requires a sturdy roof and a stable foundation. Without a strong roof and secure foundation, your house may eventually fall apart and lose its monetary value. At Gold Roofing, you never pay any money until the work is completed by our experienced roofing contractors. If you are not satisfied with the results, our roofers will even repair your roof again without charging you any extra fees. Work performed by Gold Roofing contractors is inspected by an overseer who ensures the ultimate in perfection. In addition to restoring your roof in Brisbane, we also replace gutters. Hiring an amateur handyman to replace the gutters may result in a minor catastrophe. Plus, you may need to pay the person a second or a third time to ensure that the work is up to par. Gutter work requires a certain type of artistry. Fortunately, our contractors have the talent and knowledge to ensure that every aspect of each gutter is replaced with precision. Plus, you do not need to worry about cleaning up a mess in your backyard or front yard. Our workers take the time to clean up all the debris before leaving your premises. Note that the fee you pay for a superior gutter replacement job also covers cleaning up your yard. Obtain your free quote today by filling out and submitting a simple form. Visit our official website and inform us about the type of roof restoration you need along with information about the roof type and slope. You can also let us know if you are interested in having your roof cleaned or painted. Plus, you have the option to receive a written inspection report about the condition of your roof at no extra charge. Call (07) 3276 0464 now for details about your roof restoration Brisbane project.